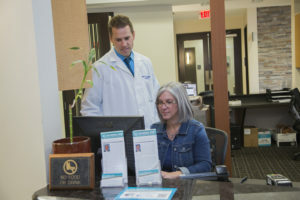 Dr. Jason Gorscak is an Ophthalmologist at Florida Eye Microsurgical Institute located in Wellington who focuses on comprehensive eye care including diagnosing and treating cataract conditions, glaucoma and diabetic retinopathy. 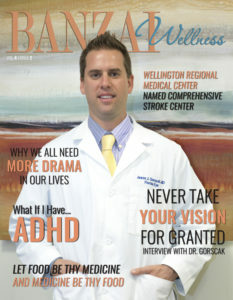 In an interview, “Banzai Wellness Magazine” learned about his passion for helping people, his love for family and his thrill for car racing! Dr. Gorscak also kindly reminds us to never take your eyesight for granted. How did you decide to specialize in Ophthalmology? I knew I wanted to be a Doctor my senior year of high school after my grandmother passed from cancer. During that time she was seeing a number of doctors and going through a lot. As rough as it was for her, the doctors were so supportive and really good doctors. It inspired me to become one and do the same thing for people. After attending Johns Hopkins, I went to Medical School at the University of Miami School of Medicine. However, I didn’t know what I would specialize in. There was a facility, Bascom Palmer of Jackson Memorial Hospital where I worked, observed ophthalmics, and attended surgeries. There was one patient in particular in her 90s who had such advanced cataracts she was legally blind. She came to Miami with no insurance but they had a charity program for her to obtain cataract surgery. I was there the day they took the patch off her eyes and her face was lit up with jubilation – such a big smile – so happy and so thankful! After that day, I said this is what I want to do. It was a very easy decision after that cataract surgery became my focus. Tell us more about Florida Eye Microsurgical Institute and the environment. Why did you choose to work at this practice? When I first interviewed at Florida Eye Microsurgical Institute in 2008, I knew everyone was working here for the right reasons. Our foundation is to make patients feel welcome and know we care. Every doctor here is passionate about what they do. Not only are they intelligent, qualified, and good surgeons, but you can tell – they care about people. A team of multi-specialty Doctors is a major benefit to patients. Can you tell us more about the Specialists and the advantage to an all-encompassing group of Doctors? During a comprehensive, basic eye exam we will check for everything. If a condition exists and it is cataract or glaucoma, then I would provide treatment for the individual. If it is something else pertaining to the eye that doesn’t fall into my specialty, then I can direct a patient to the appropriate Doctor in our practice to manage the specific issue. I focus on cataracts as my primary, and glaucoma as my secondary. We have two retina specialists who handle conditions like macular degeneration, and diabetic eye issues that can affect the retina. We also have one pediatric ophthalmologist for children, and one cornea specialist – who does corneal transplants from scars or infections and another General Ophthalmologist that does all the exams. The advantage of working in a multi-specialty practice like this is how the Doctors work together to help each other out so the patient receives the appropriate level of care. For example, if I see something on a retina scan that doesn’t look quite right, I can speak with our Retina Specialist. We have the ability to cover a multitude of conditions. A doctor at this practice can cover a multitude of concerns without having to refer a patient out to somewhere else. We have the ability to cover a multitude of conditions without having to refer a patient out to somewhere else. The only thing we don’t do is most cosmetic concerns such as Lasik or plastic surgery, but everything medical we do. The titles Ophthalmologist and Optometrist are often confused or misunderstood. Can you clarify the difference between the two? 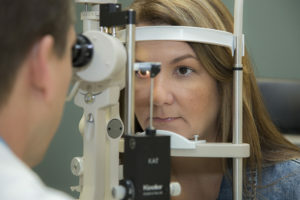 Optometrists specialize in glasses and contacts. They do routine eye exams as well and play an important role in eye care. Ophthalmologists are Medical Doctors that specialize in the management and treatment of surgical and medical diseases of the eye. We tend to use more technologically advanced equipment to diagnose and manage all types of ophthalmic diseases. Sometimes we can even diagnose systemic disease including brain tumors, autoimmune diseases or diabetes. What symptoms do you specifically treat and what is your typical patient? I have a 50/50 mix of patients of all ages that come to me for routine eye exams and other problems. People with cataracts are typically 60 years and older. The common symptoms you may initially have are glare or sensitivity to headlights at night, fogginess, blurriness and difficulty seeing your television screen, even with the proper prescription glasses or difficulty reading. A common symptom I hear from patients is not being able to see their golf balls anymore when they hit it down the fairway. There is no pain associated with cataracts. People might think their glasses are dirty or prescription is wrong. Even with the correct prescription they still may not be able to see well or think it is quite right. Cataract symptoms are very subtle. Cataracts gradually develop over many years. Are there any other examples of causes of cataracts? Medications can cause cataract formation – an example is people who take Prednisone. Anyone can develop them, especially from trauma or prior injury but they are most common at an older age. How do you diagnose cataracts? It is still the old-fashioned checking visual acuity, checking glasses, and a dilated eye exam so I can look into the eye and the lens of their eye where the cataract forms. What can you tell us about Glaucoma and treatment? Glaucoma is a silent disease that can lead to blindness. That is why it is extremely important to be monitored with periodic routine exams, especially if you have a family history. It also is more prevalent with age. There is an in-office treatment with the newest laser Selective Laser Trabeculoplasty, or SLT, used to lower intraocular pressure and prevent the progression of glaucoma without having to undergo surgery if medications are not enough. Can you tell us about other technological advancements? Technology in cataract surgery has advanced in the last 10 years. We now have fematosecond laser, for cataract surgery. This is the newest technology where we use a laser instead of using a blade. The laser provides a way for me to customize the surgery to each of your eyes individually in a way that it provides more precision and clarity therefore afterwards. In addition, there are intraocular lens implants. We have always used them but nowadays the implants are so advanced that your glasses prescription can be built into the lens so that you can see both far and near without glasses. Reading glasses can be completely eliminated with cataract surgery. We can also fix a stigmatism. The technology is so good that the procedure itself only takes about 10-15 minutes, it is an outpatient procedure (not done in a hospital) and no overnight stay. Healing time only takes about a day on average. There are no stitches and no patches. You leave surgery and the next day you see a lot better. It’s pretty amazing! What advice for eye care prevention and taking care of eyes? It is important to have your eyes checked regularly. People sometimes take their vision for granted. People are busy and they don’t realize how important their sight is until something happens. I’ve had a large number of patients in their 20-30s who are now blind but it could have been prevented. They never were checked with routine eye screenings and exams. I recommend exams once every 2 years up until age of 50. After 50, get checked once a year. It is very important to protect your eyes from the sun- wear sunglasses (polarized is best) or hats especially in Florida, since UV light from the sun can cause eye diseases. Using an artificial tear isn’t recommended but cannot hurt you. Never sleep in contacts no matter what anyone says or what is advertised. Again, routine exams are the best thing you can do. Thank you for sharing your knowledge. I can tell you enjoy what you do and have a passion for helping people. I truly have a passion for people’s vision. Every day and person is different. I treat everyone as an individual. If I can make people see or look better, that is what drives me. I live by the idea to treat others as you want to be treated yourself. I do that here and at home. You can’t expect kindness if you don’t show kindness. I think that the entire staff at Florida Eye Microsurgical Institute is the same way and loves helping people. In turn, patients can sense that. We are grateful that the majority of our patients are extremely satisfied and are a heavy referral base by word of mouth. I also like that we are also involved in the community. Gwen Cohan, our Director of Marketing, plans and sponsors charity events to help people in need. Besides your career, what are your hobbies outside of work? I’m a family man. I have a wife and kid who I love to spend time with outside work. Then my crazy hobby is racing cars. I am in a few different clubs and enjoy racing on a track. It is exhilarating and my stress relief! How can patients find you? There are multiple locations but my practice is located at 2575 State Road 7 in Wellington. You can make an appointment with the front desk at (561) 792-1205. It was a pleasure speaking with you Dr. Gorscak! 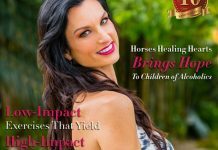 Thank you for speaking with Banzai Wellness Magazine. Thank you for your valuable time.